Now Facebook will see around 8 billion average daily video videos from 500 million users. With the Facebook becoming another popular place where people share and post videos, there's a side-subject that must always be broached: any Facebook video converter that can help with Facebook video sharing. Whenever users want to download/convert Facebook videos that are interesting for iPhone iPad offline, or simply need to convert videos for Facebook upload easily, they will need a solid video processing tool for Facebook. 1. Download/convert Facebook videos: the FB video converters will download and convert Facebook video to MP3, MP4, AVI, FLV etc for free playback and edit offline. 2. Convert videos for Facebook upload: the Facebook converters will convert various HD/SD videos for Facebook upload supported formats without size, format limits. See the best Facebook video format supported list. ▶ Free download movies, TV shows, videos, music in 4K/1080p/720p from Facebook, YouTube and other 1000+ sites. ▶ Convert Facebook video to mp4, MP3, FLV, avi, mov etc for iPhone Xs Max/Xs/XR, iPad Air 2/mini 4, Samsung Galaxy S9 edge more with 420+ readymade profiles. ▶ Convert SD/HD videos (4k included) to Facebook supported video format, resolution, codec, etc. ▶ Hardware acceleration guarantees world's fastest speed (5x faster). ▶ Customize Facebook videos by trimming to suit Facebook supported file size and duration, watermark adding, srt/captions adding. ▶ Works seamlessly on Mac (macOS Mojave) and Windows (10). Prior to the Facebook video download and convert, please make sure to free download the Facebook video converter for Mac or Windows version for PCs, install and launch it. Click "YouTube" > click "Add Link" and paste the Facebook video URL to the box > click "analyze" > Choose the output formats or devices > Click "Browse" to specify the destination folder > Hit "Download Now" to start the Facebook videos download and conversion task. Click "Add Files" > Choose a Facebook supported format in the popped-up window. MP4 format with H.264 codec is recommended for FB video uploading > Adjust the video parameters to adjust bit rate, frame rate, aspect ratio etc > Click "Browse" to specify the destination folder > Click "RUN" to start Facebook video conversion with the best video converter for Facebook. This FB video transcoder & downloader can free download and convert video clips, music, tv shows etc from Facebook, YouTube, Vimeo, Dailymotion and as well as adults sites like xnxx, xhamster etc. It will convert Facebook videos to MP3, 3GP, AVI, MKV, WMV, iPhone, PSP, Android for easy playback. 1. It is easy to use and provides various Facebook video conversion options. 1. Frequent crashes for some users. 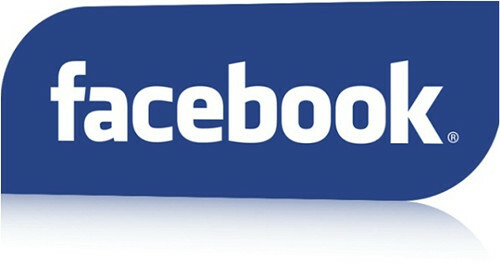 As the name suggests, this is an online Facebook converter & downloader. It is specially designed to free download and convert Facebook videos to MP4, MP3, 3GP, AVI, MKV, WMV, FLV and various other formats, and to devices like iPhone, iPad, iPod, Samsung, HTC etc. It's easy to use and no installation is needed, but users have to register to start with this video converter for Facebook. 1. Supports video download and conversion from Facebook and 200+ sites. 2. Provide a slew of output audio video formats. 1. The Facebook conversion is slow and need quite a long time to complete. 2. You will need to start over if you lost your connection in the middle. 3. Facebook videos no sound problem occurs. MacX YouTube Downloader is a free Facebook MP4/MP3 video downloader which is capable of downloading Facebook videos in whatever format or resolution (4K 4096p/8K included), covering MP4, WebM, FLV and other 300+ video sites like YouTube, Vimeo, Vevo, Metacafe, xtube, xnxx etc on Mac (macos Sierra included). 1. Supports online videos from Facebook and 1000+ sites. 2. Fast FB video download speed. Handbrake is popular free DVD ripper and also a good video converter for Facebook. Handbrake is able to convert video from nearly any format Facebook videos to MP4 (.M4V) and .MKV, two formats that are supported by Facebook upload, with Closed Captions CEA-608, SSA, SRT. It's 100% free, and the output quality is also acceptable. 1. 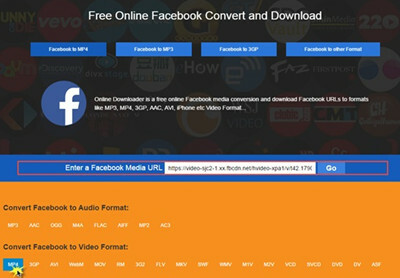 A free and popular Facebook to mp4 converter. 2. Convert video on Mac with fast speed and good quality reserved. 2. No advanced editing feature to further adjust the FB videos to suit the upload limits. 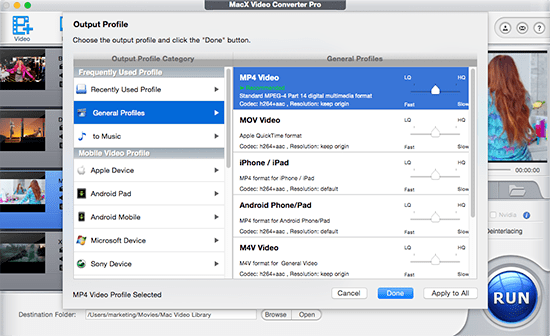 MacX Video Converter Free is another free Facebook video converter, as it converts among 8K/4K UHD, HD 1080P/720P, SD videos between AVI, MP3G, FLV, MOV, MP4 etc for Facebook upload. It features various useful editing functions to edit the Facebook videos in acceptable size, resolutions, settings. 1. Can't download Facebook or other online videos.